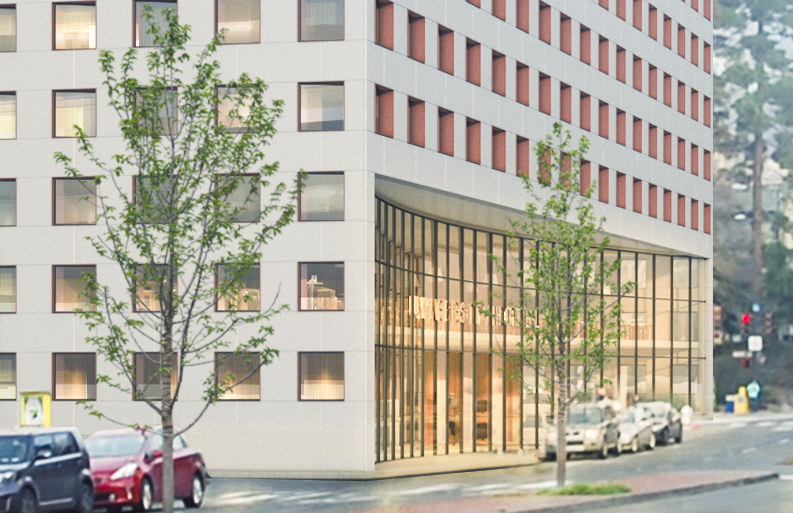 The design for the Berkeley hotel project was in response to a request for proposal by the University of California for a full-service hotel with a minimum of 200 rooms and a conference center. The design team included TCA Architects as executive architect, Stanley Saitowitz Natoma Architects as building designer, and Weisbach a|d as interior architect. 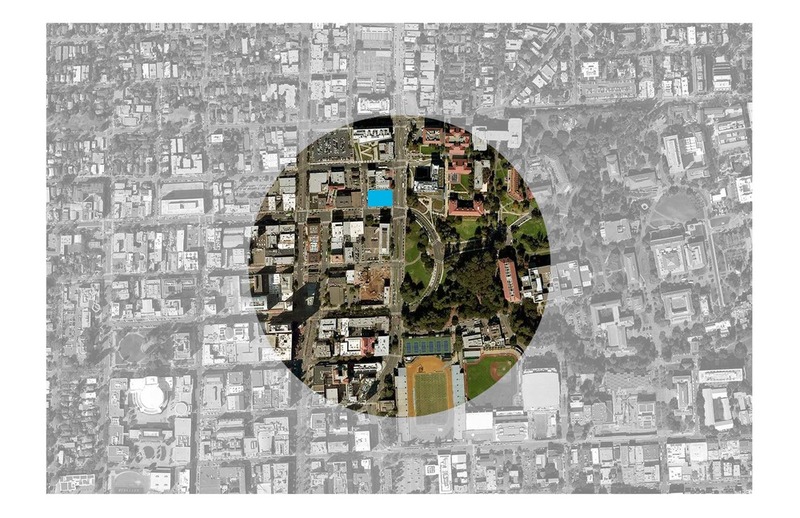 The site is between downtown Berkeley and the western edge of campus, and at the terminus of University Ave. The architectural character of the western edge of campus is defined by a collection of neo-classical buildings designed by John Galen Howard. The buildings are 2-3 story structures with very rational deep-set windows, gray granite cladding, and red clay tile roofs. The buildings are sited in an informal landscape setting following the overall framework of a “university in a park” as established by successive early 20th Century campus plans. The large circular drive envisioned by John Galen Howard’s plan, and still the formal entrance to campus, is directly catty corner to the hotel site. The building architecture borrows from the rational approach of the early campus buildings. The hotel is clad in pre-cast concrete panels with deep set rationally organized windows. The organization of the windows and wall create a simple repetitive grid. The windows are canted within the deep openings in response to their solar orientation to provide shading. The frame of the deep set window opening is finished with a terra cotta panel to reflect the color of the red clay tile roofs of the campus buildings. 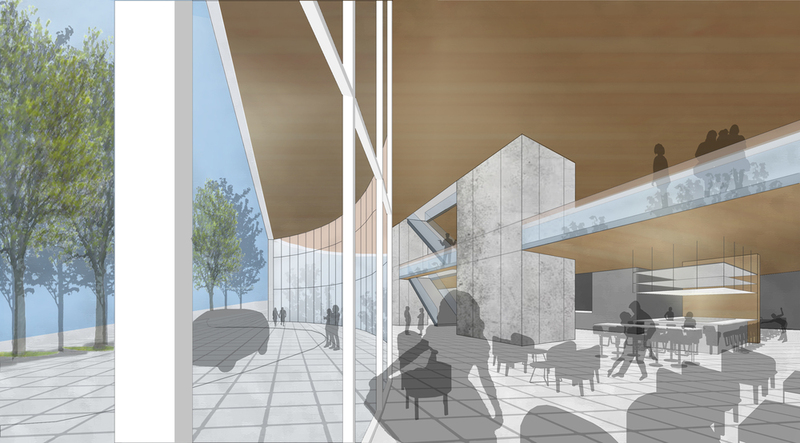 The arrival and public floors of the building that contain the lobby and conference center are carved away by a continuation of the arc that forms the entry drive to campus. The arc generated by the response to the campus drive provides a convenient vehicle turnout and porte-cochere for arrival at the hotel. These architectural responses contextualize the proposed design to its site and bring the campus into the adjacent downtown Berkeley and blur the line between town and gown. 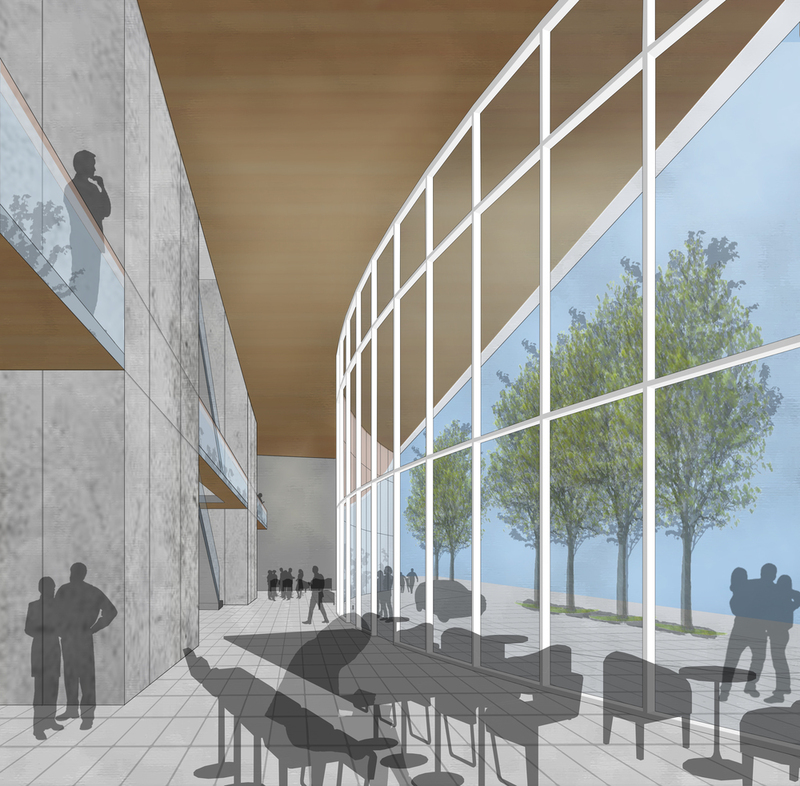 Given the small footprint of the site the massing was approached similar to an urban hotel. 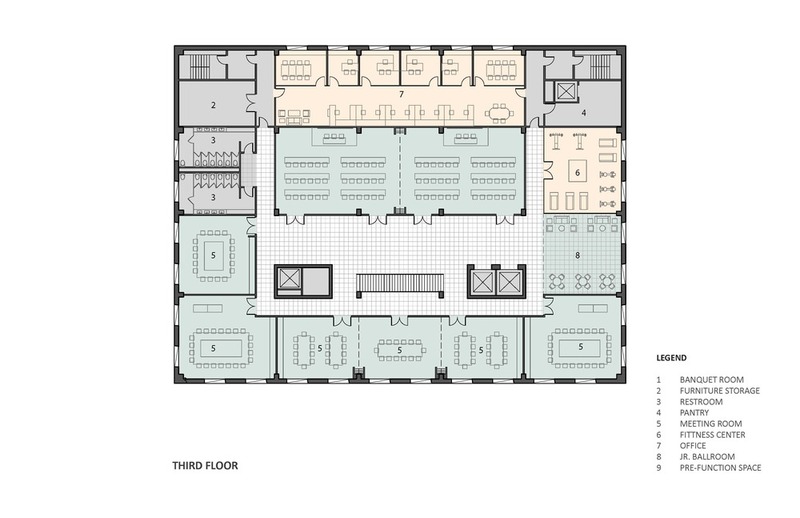 The vertical circulation and the guest rooms floors were carefully integrated with the optimal layout for large conference room spaces located on the second and third floors to minimize load transfers and maximize seismic design opportunities. The hotel is 11 stories over two levels of below grade floors that contain the service functions and parking. There are 8 floors of guest rooms over 2 floors of conference space and a ground floor that contains the lobby, restaurant and bar, registration and administration, loading dock and receiving, and main kitchen. There are 24 guest rooms per floor, with four different room types. Half of the guest rooms have single king beds, and half have two queen beds. All rooms have baths with four fixtures and a built-in “scholars desk” at the window. Circulation is double loaded for efficiency and the room count facing East and West was maximized to take advantage of picturesque views of the campus to the east, and of San Francisco Bay and the Golden Gate Bridge to the west.